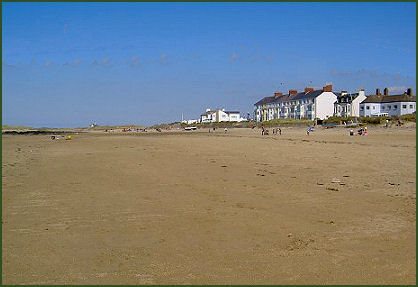 The coastal village of Rhosneigr is a popular holiday resort situated on the south west side of the Isle of Anglesey. Rhosneigr boasts three beaches- Cymyran Beach, which stretches from Rhosneigr to the village of Rhoscolyn, the 'Town Beach', a small, rocky beach with stunning views of the mountains of Snowdonia, where yachts are often moored, popular with windsurfers and sailors and 'Traeth Llydan' or 'Broad Beach' which runs from the Barclodiad y Gawres ancient monument to Rhosneigr, ranging from pebble to sand with rockpools at either end, the beach is backed by sand dunes, Broad Beach is a popular spot for canoeing, walking, surfing and a range of water sports and is a regular winner of the coveted Green Coast Award. 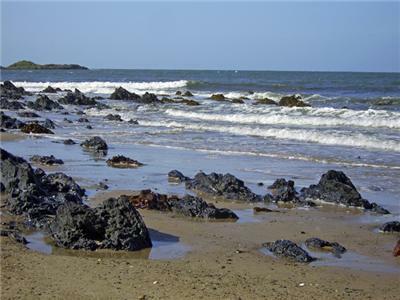 The Anglesey Coastal Path passes through the village, a 200-kilometre (124 mile) long distance footpath which follows nearly the entire coastline of the island, which is designated an Area of Outstanding Natural Beauty. The coastal path passes through a varying landscape that includes farmland, coastal heath, dunes, salt-marsh, foreshore, cliffs and a few small pockets of woodland. Llyn Maelog (Maelog lake), a small shallow lake with fringing reedbeds situated behind the sand dunes of Tywyn Llyn common land, is a designated Site of Special Scientific Interest. The lake was the water supply for the village until 1968 when the main water supply was connected to Llyn Alaw. A large variety of birdlife inhabits the reedbeds, including Grey Heron, Snipe, Reed Warblers, Coots, Mallard and Shelduck. Cormorants can often be seen on the rocks, annual visitors to the lake are the Grey Lag Geese from Scandinavia. The lake is circled by public footbath and is popular with walkers. The village has a number of amenities for tourists including a convenience store, Post Office, and pharmacy, caravan sites, camp sites , pubs, hotels and cafes. The nearby Neolithic burial chamber of Barclodiad y Gawres at Cable Bay, which name translates as the 'Giantess's Apronful', is of significant historical importance, featuring some of the oldest artwork in Europe. Several of the chamber stones bear carvings of lozenges, zig zags and spirals, but what makes some of them exceptional is the way the carved shapes are manipulated and shaped with each other to form an overall integrated design. This type of burial chamber is related to some of those in Ireland and further links with that country are provided by the carved stones that make up the tomb . The monument is in the care of the Welsh heritage organisation Cadw.